An ominous tone in the early shots reveals a thread of certainty: things are about to get rather grim. The narrator speaks in subliminal passages, suggesting an almost relaxed acceptance of what lies ahead. Half a century into the future, the sun is near death, and Earth’s survival is threatened as the great star in the sky begins fading out of view. Mankind dares to challenge that fate with a rather impractical mission: dispatch a spacecraft into the far reaches of our solar system to reignite the sun, and do so by launching an explosive nuclear device into its orbit. Seven years prior, the Icarus I set off to undertake this daunting task but disappeared without a trace before reaching the fiery orb; now the Icarus II – a space vessel filled with intelligent brooding sorts who are driven by contemplation and underlying anxiety – inches closer to its destination, and time is no longer a luxury. But stories of this nature do not exist to exercise peaceful resolutions either, and as “Sunshine” builds ploddingly towards the operative moment of its premise, the err of man inspires a relentless source of chaos, danger and assured doom. And those are the movie’s more subtle distinctions. Ideas this imposing scarcely belong in anything that dwells in the shadow of plausibility, but the genius of Danny Boyle’s “Sunshine” is that it sees such an idea through total unflinching pragmatism. One might say it is reminiscent of the chutzpah that inspired Ridley Scott to make “Alien,” another film in which a premise of B-movie fodder was enriched by a convincing framework. The key in successful science fiction often comes down to creating thoughts and images that leap off of the screen and into our consciousness, but every once in a while something comes along so driven by its resistance to boundaries that it pushes the mind beyond that, often into very challenging territory. In an age of technical advancements when filmmakers have circumvented ideas for synthetic visual thrills, here is a movie that plays like some decisive, brilliant rebellion to that pattern. What inspired such boldness? The director, Danny Boyle, knows a thing or two about causing watersheds in established genres. He and his writer Alex Garland worked together prior for the magnificent “28 Days Later,” a sleeper hit in 2003 that reinvigorated the zombie picture, and in isolated quarters both also contributed fresh modern perspectives to a handful of films set within otherwise simplistic narrative groundwork (Boyle with “Slumdog Millionaire” and “127 Hours,” Garland with “Never Let Me Go”). Together, I suspect, there is a desire in them to use their synergy to greatly ambitious heights; it is just as well that their endeavors have brought them to the forefront of science fiction, where the undiscovered far reaches of the universe have yet to colonize our minds. There is a certain level of caution present, however, as the movie swims around its premise in search of the right notes to strike. Early establishing shots are quiet and almost static in their nature: the camera simply stalls in lengthy corridors of a space ship for slow unbroken takes, and then the 8-member crew is introduced in gradual interludes. Among them: Robert (Cillian Murphy), a reserved sort whose inclusion on the voyage seems discordant with the scientific nature of his comrades; Kaneda (Hiroyuki Sanada), the meditative captain of the mission; Corazon (Michelle Yeoh), the optimistic proprietor of the vessel’s lavish greenhouse; Mace (Chris Evans), an arrogant and opinionated sort who often comes to blows with other crew members; and Searle (Cliff Curtis), a quiet thinker who isolates himself on the viewing deck of the ship and inaudibly lusts over the dying sun with long intense gazes. As scenes progress, this pattern is exemplified by subtle indications of skin peeling on his face. In most movies, crews of this nature emerge as colorful additives to their stories, but “Sunshine” elects to subdue them; they exist in the foreground without specifics to thoroughly distinguish their personas, and seem enslaved to the exhaustive nature of their journey. Those realities, we suspect, are made so based on the narrative’s incentive to treat the subject from a place of enervation – this is not a mission of discretionary nature, but of paralyzing austerity in which people have reached the 11th hour of an endless trek through space, and can no longer grasp the emotional gravity that has been placed on them. Intriguing responses result from this premise once new information emerges in the Icarus II’s final days of travel: the first ship thought lost seven years prior is discovered behind Mercury, and discussions ensue among the crew as to whether their odds for success in a mission all about guesswork would improve by acquiring the explosive cargo still aboard the original. Then comes further uncertainty. If Icarus I never made destination but is clearly still intact, what exactly happened on board the ship to cause the failure? Because its whereabouts would take Icarus II slightly off course from its intended destination, is it a risk worth investing in? Arguments between crew members emphasize the impending ambiguity that exists in both scenarios, but when one opts to take the initiative to seek out the other spacecraft, he misses a couple of key components in re-aligning the ship’s solar panels, triggering a chain reaction of conflicts that involve critical ship repairs, disastrous fires, compromised oxygen supplies and, ultimately, accidental death. In the wake of those realities, Icarus I and its resources become no longer just a possible detour for this mission, but a necessity. 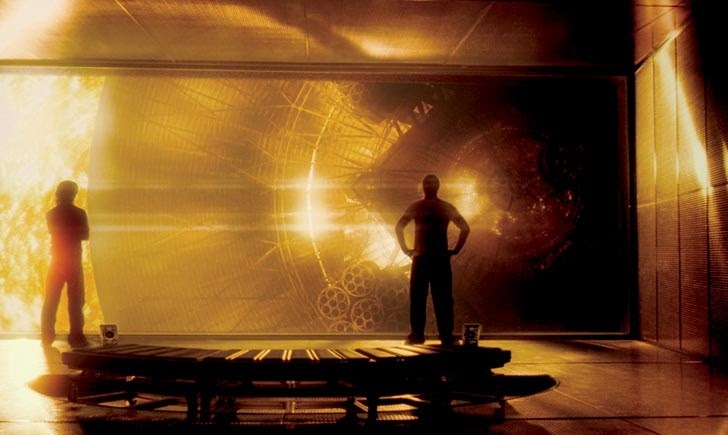 To assist in building credence in this narrative suggestion, Boyle refers to some of the finest science fiction films of our time for influence – notably, Kubrick’s “2001: A Spacey Odyssey,” Tarkovsky’s “Solaris” and Scott’s “Alien,” all of which permeate from the movie’s distinctive sense of style and pacing. Like those directors, he seems to find more resonance in the quiet reverberation of images rather than lofty or explosive action, which enriches the quality of this story. Most of the movie’s greatest shots are simply of the sun itself, which is spied through an elaborate viewing room in which we see the sphere almost pulsate in on itself, parts of it appearing as if darkened like charcoal. Meanwhile, the exteriors of the Icarus II are so grandiose and distinctive that it’s nearly an overpowering sight – a small cylindrical vessel is protected from solar rays by thousands of mirror panels that mushroom out into a shield, and it glides across the starry landscape looking like a giant metal umbrella. Other notable technical touches: the ship’s corridors extend long distances and then stretch around corners like pieces of an impossible labyrinth, all while resembling the interiors of a military facility. When Icarus II establishes connection with its dormant sister ship off the surface of Mercury, the movie stages the hook-up in the only way we suspect two odd-shaped ships ever could: by docking at sharp angles. When the plot requires characters to spacewalk for ship repairs, they appear in bulky golden costumes: distinctly primitive, and yet endearing because of, well, their practicality in this particular realm. And the voice of the Icarus’ computer mainframe does a good job of channeling the nonchalant forwardness of Hal 9000 without directly ripping it off, even though its knowledge of the rules and boundaries of its reality are sometimes alarmingly insightful. There are even more dire circumstances dancing around the characters than already mentioned, and some of them shift the movie’s tone from meditative to manic in rather ferocious qualities. Some viewers may be put off by that notion, perhaps concluding that the transitions (as well as a very ambitious climax) are examples of a filmmaker retreading to formula as a way of copping out of a more restrained resolution. My thought process: can it really be done any other way? In a movie audacious enough to assume mankind is capable of physically travelling to the sun and re-igniting it in order to save Earth from an endless ice age, what can we possibly hope for? The difference in “Sunshine” is that the conclusive actions are not staged so traditionally that they emerge as clichés, and more formulaic approaches are done with such distinctive energy that the movie warrants their usage (a faceless villain, for example, is never seen in clarity because he always appears in front of cameras as if a smear in the frame). By the end, there is no doubt that what we have seen is any less than an effective representation of this bleak and solemn human reality, and that is clearly enough for the it to hold a resounding power over our blistered imaginations.